A 150 million-year-old Chinese fossil site provides an extraordinary new window on the origin of one of the major groups of living amphibians. More than 500 fossils, many of which preserve the entire skeleton and impressions of soft tissues provide compelling evidence that the salamander originated in Asia according to a report in the March 29, 2001 issue of Nature. "All the major primitive salamander families are now known to be present in Asia," said Neil Shubin, professor and chairman of organismal biology and anatomy of the University of Chicago. "The simple, take-home, message is that there is an Asian origin for all salamanders." "The diversity of species in this find, combined with molecular data and study of characteristics from living salamanders, leads to the inescapable conclusion that almost all the major groups of salamanders evolved very early," said Shubin, "And not much has been happening since." "These fantastic Northern Chinese sites are providing us with a wealth of new fossils," said Keqin Gao, of the American Museum of Natural History in New York. "The same set of beds provided evidence of feathered dinosaurs." Salamanders, one of the three major groups of modern amphibians, are important to understanding fundamental questions in evolution. Their wide geographic distribution, highly variable species and ecological diversification have served as a model system for assessing developmental, anatomical and biogeographic evolution. "There has been a huge gap in the fossil record. The origin of salamanders was poorly documented, the fossil evidence was just inadequate," said Gao. "We only had fossils of the extant salamander families going back to the Tertiary, 65 million years ago." A volcanic eruption in northern China during the Late Jurassic, 150 million years ago, provided key material for the origin of the salamander--85 million year earlier than the previous fossil record. The eruption wiped out whole communities of the earliest known salamanders but left hundreds of beautifully preserved fossils. Complete fossils, some including rare soft tissue impressions, offer a wealth of new information of the salamander's origin, life-cycle and evolutionary strategies. "We were able to see all the stages of the life cycle, larvae and adults, as well as a range of different kinds of animals," said Shubin. "The exquisite condition of the fossils offers clues to evolutionary strategies--larval details such as gills in adult animals, for example." Salamanders are living fossils--they have retained the same body plan for millions of years. "Whether you look at a salamander you find under a rock in the local forest preserve or in a rock in China dating back 150 million years, they look alike. In fact, they look alike in great detail--the bones in their wrists are the same, the way their skulls are formed--intricate details are the same," said Shubin. At the same time, their limbs and heads have served as a model of how variation arises during evolution. One of the great puzzles of evolution is how different types of salamanders evolved the same features independently. This phenomenon is called parallel evolution. 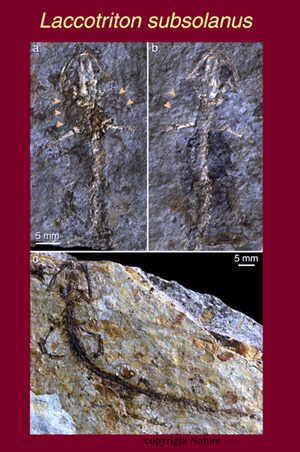 These fossils may provide answers to this old question. Neoteny, the retention of juvenile characteristics in the adult animal, is extremely important to the generation of diversity among salamanders. More than 40 salamander species in nine families display features of neoteny. The Chinese salamanders reveal that generating diversity through neoteny was already established by 150 million years ago, which may explain why parallel evolution is so common in salamanders. Despite their longevity over evolutionary time, salamanders today are disappearing worldwide. "Here is an animal that has been around for at least 150 million years. They made it through several major extinction events. They made it through the event that killed the dinosaurs," said Shubin. "Yet today, along with other amphibians, salamanders are disappearing and we really don't know why."